We get asked all the time, how do you think of your projects? Well, this one has a great story! We found Starbuck’s Frappuccino at the supermarket. The coffee drink was delicious, but better than that, the bottles look like milk bottles! We knew we had to reuse them for a milk bath. 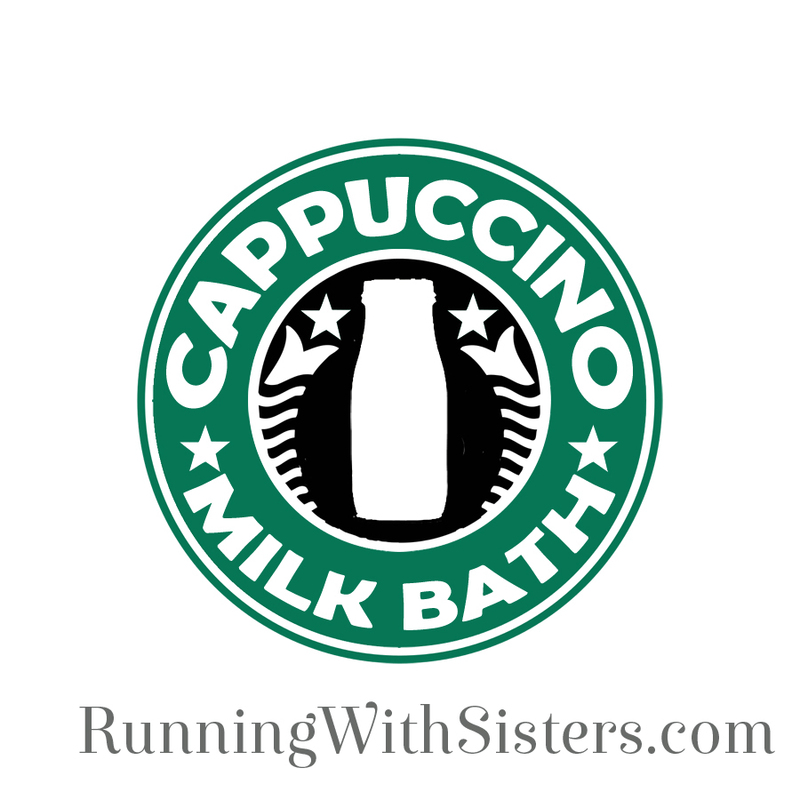 Then we took it one step further – Cappuccino Milk Bath! Of course, we had to make a label, so ours is a nod to Starbuck’s. And you can download it and use it if you want. Just right click to download. Click on the image above to view the label actual size. Then right-click to save the label to your computer. It will print 2.25″ x 5″ at 300dpi. This Cappuccino Milk Bath required a little R&D. We figured out that we needed to crush the instant coffee and the powdered milk. Even though they come “granulated”, we just wanted them a little more powdered. So we made a video showing a special trick to crush these ingredients more. We used a rolling pin! 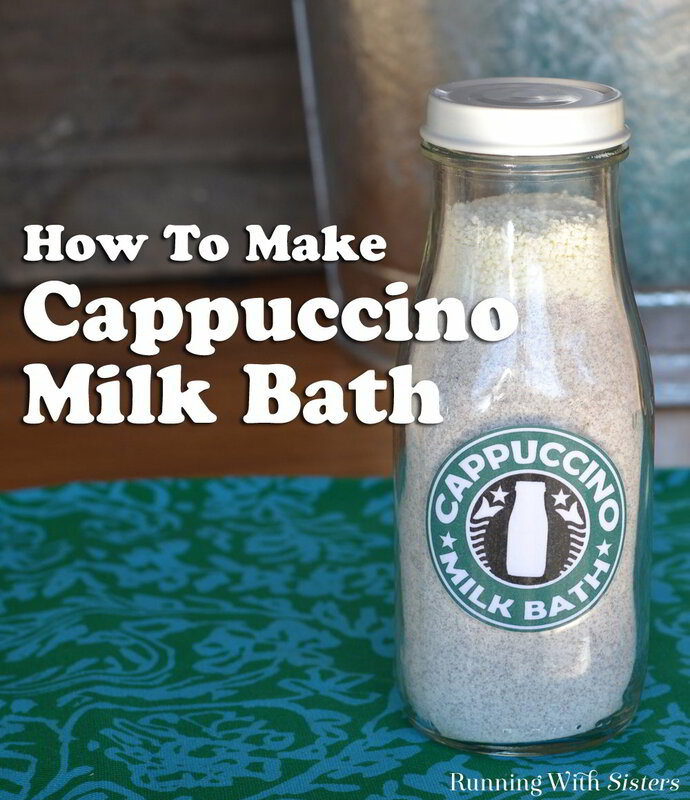 Watch us make the Cappuccino Milk Bath then use the instructions below to make your own! 1. Start by washing the bottle and removing the label. The label on our Frappuccino bottle came off with soap and water. If your bottle is recycled and has a sell-by date stamped on it, remove it with a nail polish remover pad. Let your bottle dry completely. 3. Add 4 tablespoons of corn starch and 4 tablespoons of baking soda to the mixing bowl. 4. 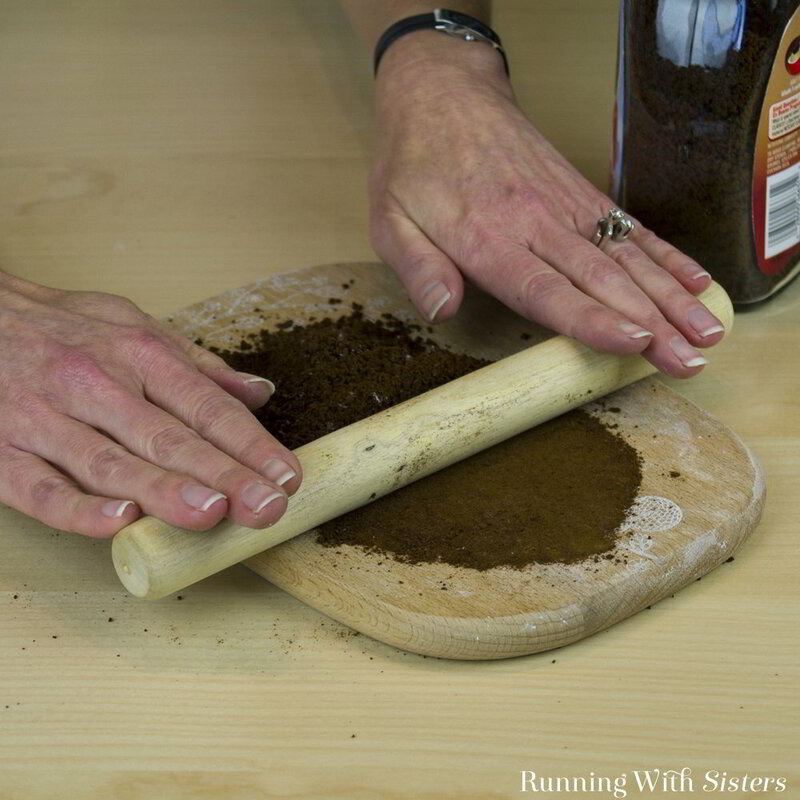 Place 4 tablespoons of instant coffee on the cutting board. Crush the instant coffee like you did the powdered milk to make it more powdery. Just roll over it with the rolling pin and then brush into mixing bowl. 5. 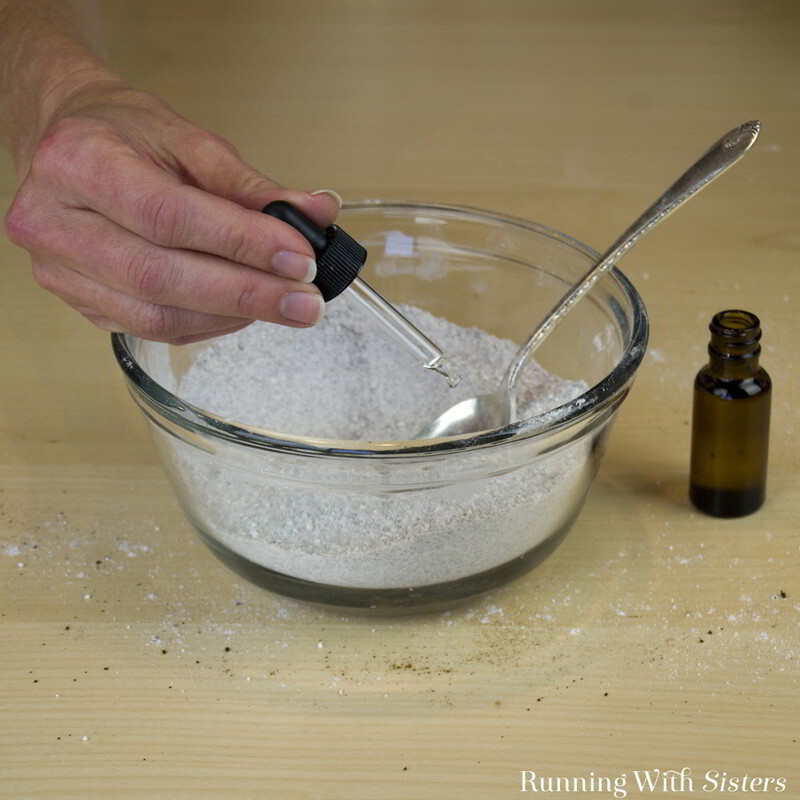 Add 5 or 6 drops of vanilla essential oil to the mixture in the mixing bowl. Stir together. 6. 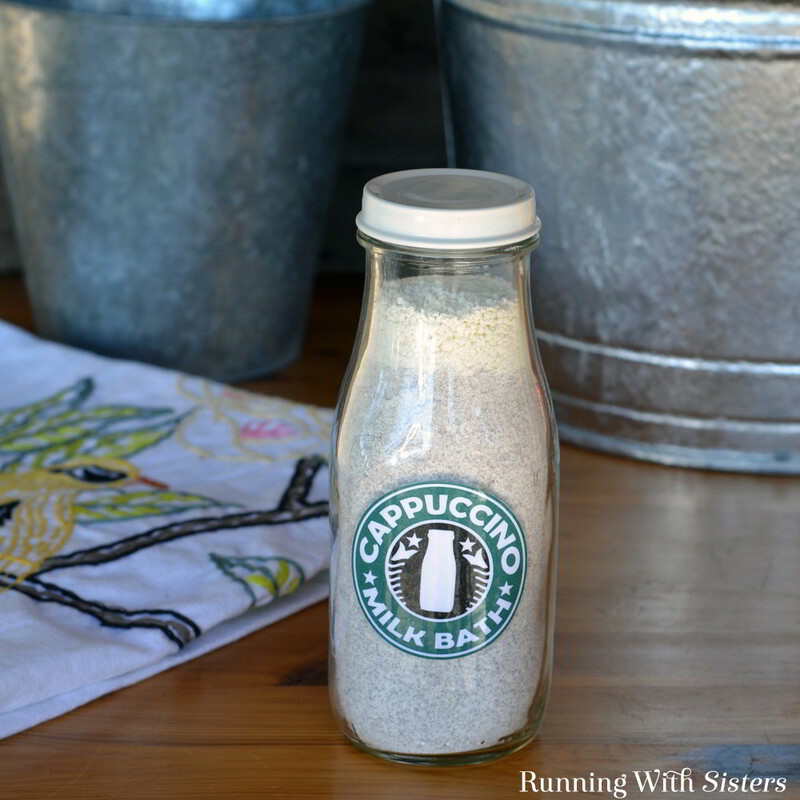 Spoon the cappuccino milk bath into the bottle. Fill the bottle, but leave 1” below the lid. 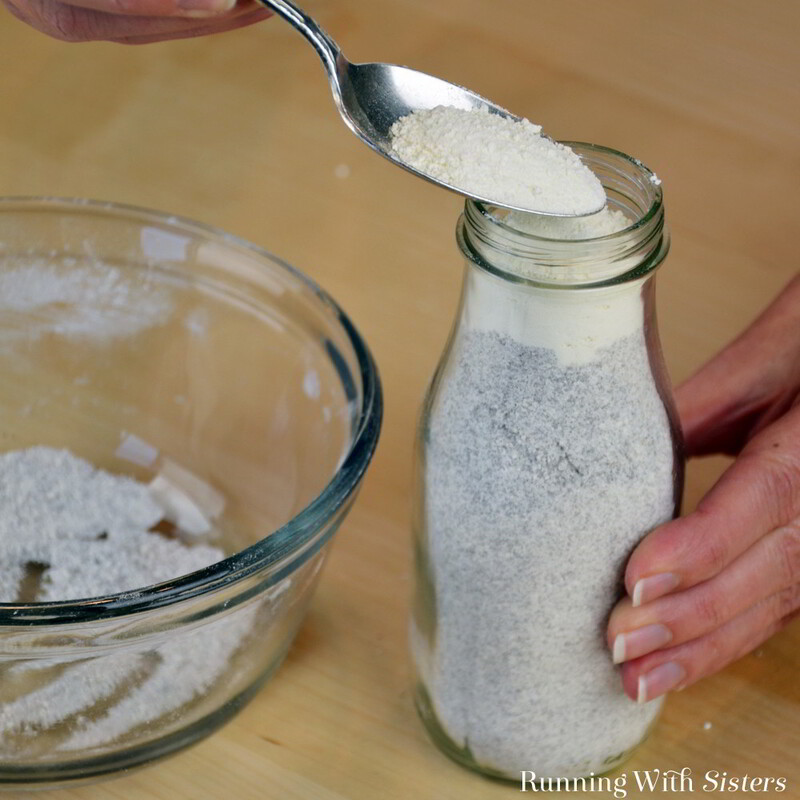 Fill this last 1” with uncrushed powdered milk. It kind of looks like foam on top! 7. Paint the bottle lid with the ivory spray paint. Let the lid dry, then place it on top of bottle. 8. Download the label and print it out. Cut the label out. Set the label down face up. Cut a 6” piece of clear packing tape. Pick the label up with the center of the tape. 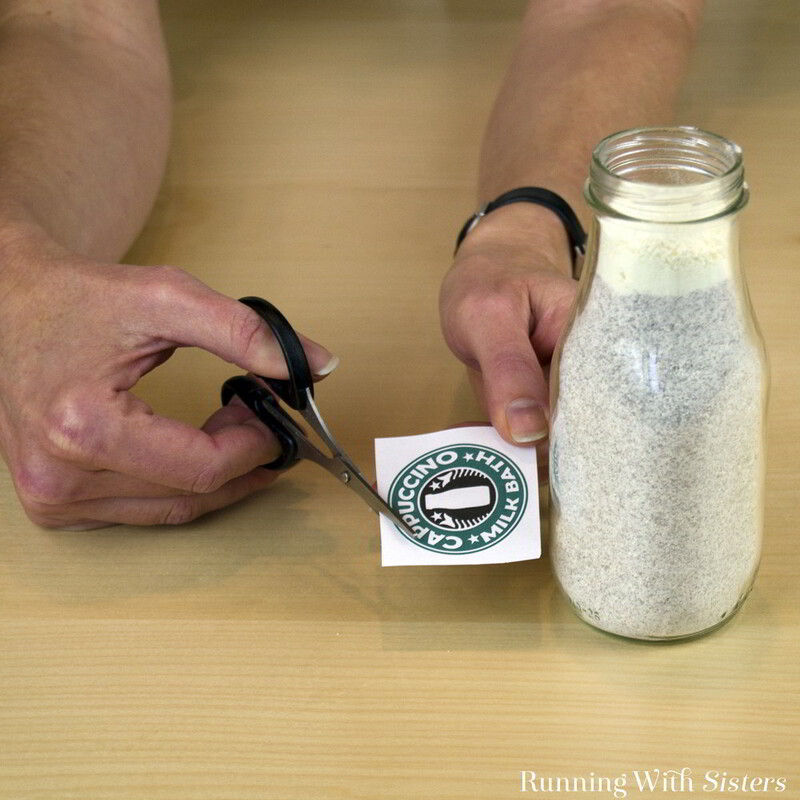 Lay the bottle down on it’s side and attach the label to the front of the jar. Wrap the tape around the sides of the jar. Cute, right? It’s the bottle! We love looking for fun containers like this to use for spa crafts. We browse the aisles of Big Lots and Dollar Tree just to look for interesting shaped jars and bottles. We’ve purchased preserved cherries, fig marmalade, and orange honey just to reuse the containers. And we got to sample some pretty interesting tastes at the same time! A mortar and pestle is a lot less messy. It’s also perfect for grinding salt finer as well as dried herbs. They come in a wide variety of sizes and materials. Where’s the links to download the labels? We have put the download instructions back up. So sorry! Have you ever tried substituting the vanilla essential oil with peppermint essential oil? That would smell wonderful Barbara!